Sports Then and Now | How Will Wrist Injuries Affect Your Quasi-Legal NCAA Bracket? How Will Wrist Injuries Affect Your Quasi-Legal NCAA Bracket? Rest is often a very good treatment as well. However, for athletes, “rest” is usually a four-letter word. Athletes are notorious for wanting to get back in the game, and win-at-all-costs coaches and trainers sometimes enable that attitude. Finally, wrist injuries are the quintessential “nagging injuries.” They feel awful for a while, feel better for a while, then start throbbing again. Sometimes, there is no rhyme or reason. But other times, perhaps due to overcompensation or due to the area’s continuing vulnerability, re-injury is a serious problem. Because of this three-way combination (brace, rest, and re-injury risk), storm clouds may be gathering for a few teams at just the wrong time of year. The high-ranked Lady Bears have been largely blowing teams away all season, virtually assuring them of a one-seed in the tournament. But the squad is a little thin heading into the postseason. Sophomore standout Natalie Chou has been struggling with a wrist injury for about a month. She’s now playing in a cast, but it remains to be seen how effective she can be. Her injury is even more significant, now that senior point guard Kristy Wallace is out indefinitely with a knee injury. 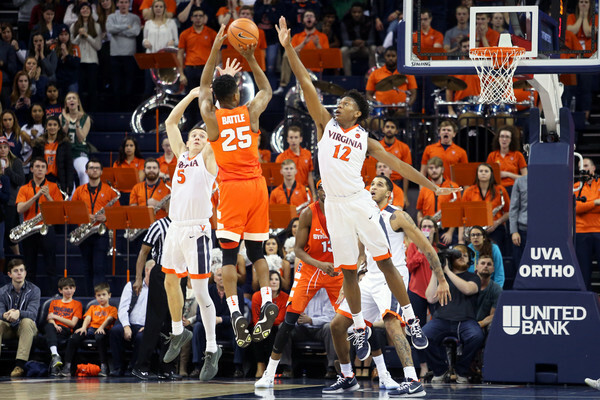 Somewhat similarly, the top-ranked Virginia Cavaliers look to be headed to a one-seed as well. But fans may not want to book travel arrangements to San Antonio just yet. Redshirt freshman sensation De’Andre Hunter has guard-like shooting and ball-handling abilities to go with forward-like size. But he’s been dealing with a wrist injury of his own on and off throughout the season, probably because he’s never taken the time to rest it. The top seed is supposed to have a soft schedule, but there’s no such thing anymore. Beating up on the likes of Saint Joseph’s and Richmond is one thing, but getting past squads like Michigan State and North Carolina is quite different. The Rams probably won’t be able to do that without senior guard E.C. Matthews. The team went into a tailspin after Matthews broke his wrist earlier this season and they have not lost since he returned to the lineup. Rhode Island is a strong team riding an impressive winning streak, and teams like that often go far. But it could all come crashing down if that wrist injury flares up. The latest predictions have the Crimson Tide as a ten-seed in a rather unimpressive region. But injuries may be a problem in Tuscaloosa. Junior forward Donta Hall returned to the lineup less than a week after wrist surgery, and he still wears a rather heavy brace. In fact, he recently commented that the post-game pain is even worse now than it was immediately after the fracture. Other teams to watch include the Tennessee men (John Fulkerson) and the Cincinnati men (Shake Milton).